Absolutely love it! Looks modern and satisficated in my living room. Measurements are exactly how described on the site. Colors can be easily coordinated with the rest of the decor. Add subtle, elegant style to your walls with this 3-piece set from Madison Park. 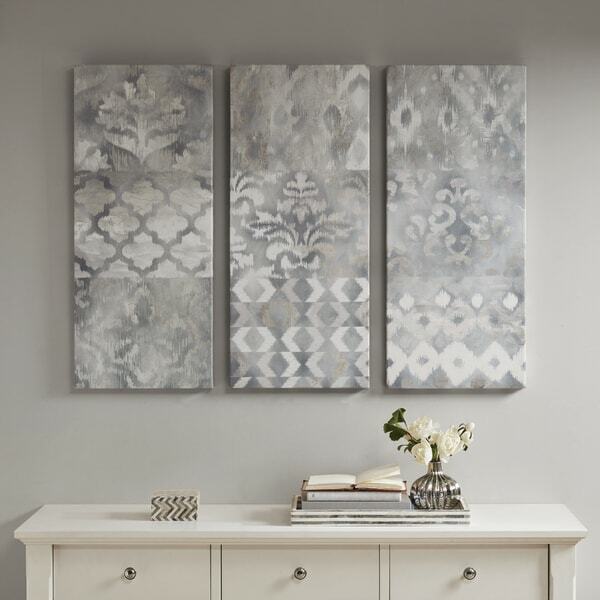 A mix of eclectic prints in taupe, white, and grey cover the gel-coat canvases to create a bohemian look. Nice, neutral colors. True to the picture. Canvas feels a little cheap but you can’t tell once on the wall. Very happy with this purchase. This is a very pretty set of 3 wall art. The patterns can go well with modern or transitional style decor. The only think that I didn't like about this is that there's a purple tinge to the gray color at night with lights on. Seems just regular gray in day-natural light. Love this watercolor on canvas. I purchased this to hang over our sofa in our new home. Beautiful piece of art. The actual product is much more stunning than the pictures. Pretty light weight pieces. I have used these in a bedroom, they are easy to hang and very subtle but beautiful additions. The hardware is in the same place across all 3 so they were easy to hang at the same height. Love how they look -- neutral and yet totally give a new look to my room! Not the highest quality - but for a wall hanging, they work great! It is lightweight, making it easy to hang. Colors are as pictured. The only thing I can say negative is the the paper corners and protective cover for the hooks are hard to remove from the pictures. These added a very nice touch to my dining room! I get compliments all the time! The colors matched exactly as I was hoping. Worth the buy! Goes perfect with my decor. Good quality. These were perfect to fill wall space in my stairwell. Great value. Does not look the same color as pictured....a little more purple looking than gray. "Is the color closer to beige or grey?" It is variegated shades of gray, but there are small splashes of beige.